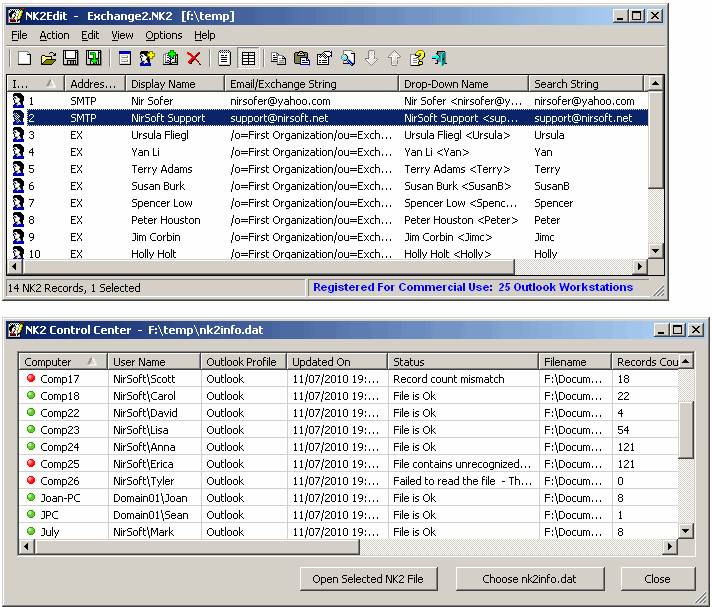 NK2Edit edits the "auto-complete" entries in Microsoft Outlook. Auto-complete is a useful feature to automatically suggest items based on the first few letters of the recipient, but over time can gather invalid or unwanted contacts. The name comes from the .NK2 file extension Outlook saves this email list to. A 64-bit version (only for using with Outlook 2010/2013 64-bit) is available. How to extract: Download the ZIP package and extract to a folder of your choice. Launch NK2Edit.exe. Fixed to remember the location/size of the Edit Record window properly, when it's not in the primary monitor. This is a powerful tool and really helps you gain the upper hand when dealing with the end user. Simple to use interface. OutlookStatView scans your Outlook mailbox, and display a general statistics about the users that you communicate via emails. For each user/email, the following information is displayed: the number of outgoing messages that you sent to the user (separated by to/cc/bcc), the number of incoming message that the user sent to you, the total size of messages sent by the user, the email client software used by this user and the time range that you send/received emails with the specified user. How to extract: Download the ZIP package and extract to a folder of your choice. Launch OutlookStatView.exe. Got some interesting data out of some of the analysis this program does. Glad to have it. 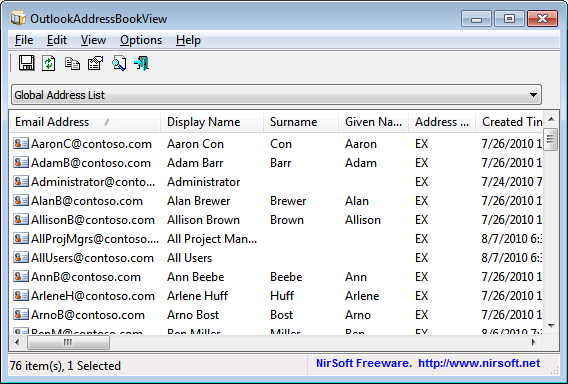 OutlookAddressBookView displays the details of all recipients stored in the address books of Microsoft Outlook. For every recipient entry, the following information is displayed: Email Address, Display Name, Address Type (MS-Exchange or SMTP), Street Address, Phone Number, Created Time, Modified Time (works only with address books of Exchange server) and more. You can easily select one or more recipients from the list and export them into a simple spreadsheet, xml/html file or copy them to the clipboard to paste into Excel or other spreadsheet application. How to extract: Download the ZIP package and extract to a folder of your choice. Launch OutlookAddressBookView.exe. Fixed bug: OutlookAddressBookView failed to remember the last size/position of the properties window if it was not located in the primary monitor. 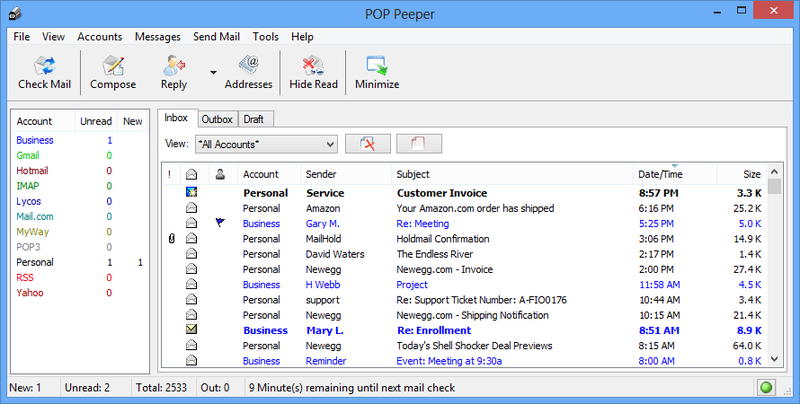 POP Peeper is an email notifier that alerts you when you have new email on any of your accounts. You can also send emails using SMTP or through Webmail directly from POP Peeper. To enable secure connections, see forum instructions. billon: just ran a check based on our listed instructions and it seems fine. Plz post what you're seeing in forums. Thanks Orca and billon. Updated. Version 4.5.0.0 is now available.